If you are new to vaping, chances are you have read or heard various acronyms and abbreviations and have absolutely no idea what they mean. So I figured I could create a vaping glossary listing these acronyms and abbreviations along with a short definition. Seeing how the vaping industry is growing by leaps and bounds, this page will be regularly updated with new information. Please let me know of any I have missed by leaving a comment below. I’ll add them the first chance I get. Unsure what a term means? 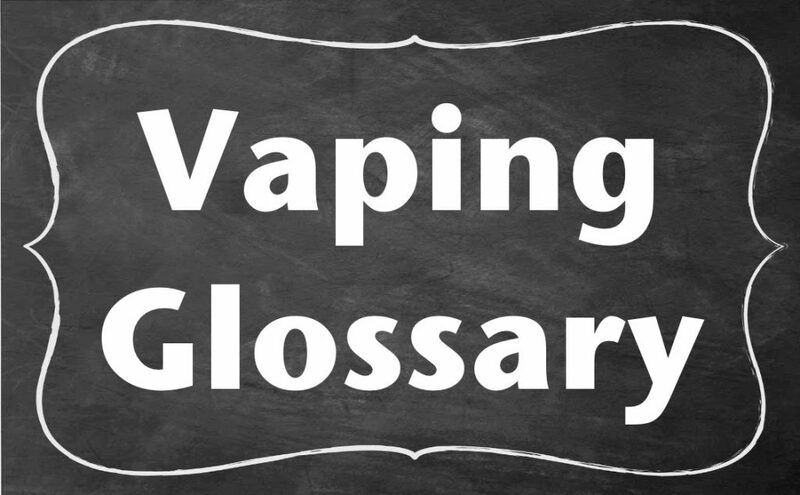 This Vaping Glossary can help. 2 Piece: Term used to identify a two piece electronic cigarette. This consists of a battery and a cartomizer/tank. 3 Piece: Term used to identify a three piece electronic cigarettes. This consists of a battery, atomizer and cartridge. 510: One of the most popular threading connection used by electronic cigarette brands. The 510 thread usually applies to the battery connector and the tank or cartridge. Ω: Ohms. A measurement of resistance. Applied to electronic cigarette atomizers, the lower the ohms, the less resistance. This equates to a hotter coil which creates more vapor. Above-ohm vaping – Any coils rated at 1.0 ohms or above. Advanced Personal Vaporizer (APV): Also known as a Mod for modified electronic cigarette. An APV normally includes a larger, more powerful battery and the ability to adjust voltage and/or wattage. Air Flow: The ability to adjust the amount of air input when you take a draw. The more air flow the easier to take a draw and more cloud production. Analog: A vaping term when referencing traditional cigarettes. Atomizer: An assembly containing a heating coil, wick and bridge. The coil is heated up by activating the battery. When e Liquid makes contact with the atomizer it turns into vapor. Automatic: This term pertains to a style of battery in which no button is used to activate the atomizer. The battery is automatically initiated when it senses the user taking a draw. Automatic batteries are mostly used with cartridge atomizers and the vaping experience most closely resembles traditional smoking. Automatic Shutoff: A feature used in smart batteries. This prevents inadvertent discharge of the battery. If the battery is turned on past the ten second mark, it automatically shuts off. Battery: A portable power device which you connect to your cartridge, cartomizer or tank. BCC: Acronym for Bottom Coil Clearomizer. The atomizer is situated at the bottom of the tank. This location is preferred by many who vape. BDC: Acronym for Bottom Dual Coil Clearomizer. Box Mod: A vaporizer typically in a box or rectangular shape. Box mods can be above-ohm and sub-ohm and tend to have variable voltage, variable wattage. Newer box mods have temperature control. Cartridge: Similar in shape to a filter for a traditional cigarette. This plastic tube contains absorbent material soaked in eLiquid. Cartridges were popular in the first generation ecigs and have since been mostly replaced with cartomizers. Cartomizer: A plastic tube consisting of a cartridge and atomizer. The two components are connected in one disposable unit. Usually the eLiquid will run dry and the user throws the while cartomizer away. CCT: Custom Curvature of Temperature: Quickly heats and cools the TC coil to allow them to work optimally. This mode is found in mods such as the Vaporesso Tarot Pro. CCW: Custom Curvature of Wattage: This mode adjusts the ramp up time of the coils in wattage mode. Cig-a-like: A term to describe electronic cigarettes which resemble traditional cigarettes in shape and size. Some common cig-a-likes include Green Smoke and EverSmoke. Circular Charger: A charging platform which is powered by a USB or wall connector. The platform allows for specially designed batteries to rest in a vertical position for charging. Usually a light emitting around the circumference of the charger will turn from red to blue when the battery is fully charged. 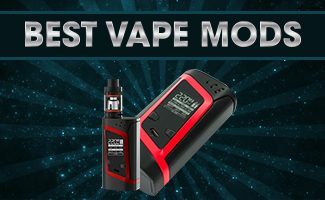 Some models which use this feature are iGO4 and VaporFi Pulse. Cloud Chasing: A term to describe Vapers who love to create a large amount of vapor. Usually this is accomplished with RDAs. Cotton: Preferred by experienced Vapers when using RDA to soak e Liquid. Cotton creates more vapor than the typical wick. It is important to use natural cotton without any dyes or chemical additives. Boiling before use is also recommended. Coil: The wire which is heated up causing the e Liquid to turn into vapor. 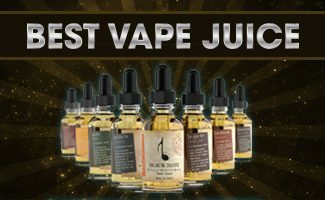 Custom Blending: Mixing an assortment of various e Liquid flavors into one bottle. Direct Lung Hit (DLH): The act of inhaling the vapor directly from the atomizer into your lungs and not letting it rest in your mouth. This style of vaping is usually done with sub-ohm devices. For above ohm devices, the user will normally do a Mouth to Lung (MTL) hit. This is the typical inhalation used when smoking a cigarette. Disposable e-cig: An electronic cigarette designed for a one time use. Once the battery and/or e-Liquid is drained, the device is thrown away. Drip Tip: Drip Tips are usually metal or plastic mouth pieces which are used in place of the cartridge. Drip Tips allows you to drop e Liquid directly on to the atomizer. No more than 4 drops are required when using this method. Dripping: The act of placing e Liquid drops on an atomizer. e-cig: An abbreviated form for electronic cigarette. There are other variations such as eCig, e cig, ecigarette or e cigarette. eGo: One of the most popular e-cigs produced. The eGo mainly comes with a 650 or 1,000 mAh battery and a 510 threaded atomizer eGo e-cigarette consists of a long 1000 mAh battery and/or a short 650 mAh battery. Variations in the eGo include the eGo-T or the eGo-C (which denotes how the atomizer heats the eLiquid. The eGo-Twist is a variable voltage eGo battery which is adjusted by twisting the end cap to the desired voltage. e-Juice: Another term for e Liquid. e Liquid: The liquid which is heated by the atomizer creating vapor. The e Liquid mainly consists of mix of propylene glycol (PG), Vegetable Glycerin (VG), nicotine and flavoring. It is also spelled as eLiquid, e-liquid, smoke juice, juice and e-juice. FDA: Food and Drug Administration. The FDA is an American government health organization responsible for protecting public health through the regulation of strict safety standards. Flooding: This occurs when too much e Liquid has entered the atomizer assembly. Indicators of flooding include little to no vapor and a gurgling sound when attempting to vape. GRAS: Acronym created by the FDA which means “Generally Recognized As Safe.” This terms usually pertains to e Liquid ingredients. Juice: Another term for e Liquid. Leaking: When eLiquid leaks on to the battery from the tank, cartomizer or clearomizer. Leaking can cause your battery to be damaged and should always be avoided. Manual: The term pertains to a style of battery which requires the user to use a push button to activate the heating coil. mAh: Abbreviation for milliampere-hour. Mainly used when describing a battery specification. Mod: An Advanced Personal Vaporizer. Mods usually have larger batteries and may have adjustable voltage and wattage. Mouth to Lung (MTL): Usually done with above ohm devices. This is the act of drawing vapor into your mouth, along with an inhalation of air, and then inhaling the vapor and air into your lungs. MTL is the traditional inhalation method used with tobacco cigarettes. Sub-ohm vaping usually utilizes a Direct Lung Hit (DLH). Ni 200: Is a coil wire used in TC Mods. The wire is over 99% pure nickel alloy and is one of the strongest metals and has excellent resistance properties. Nicotine: Used in liquid form in e Liquids, nicotine is a addictive parasympathomimetic alkaloid found in the nightshade family of plants and is considered a stimulant drug. E Liquid can be purchased with our without nicotine. Ohms: Also identified with the symbol Ω , ohms is the measurement of resistance. Applied to electronic cigarette atomizers, the lower the ohms, the less resistance. This equates to a hotter coil which creates more vapor. OLED: Acronym for Organic Light Emitting Diode. OLED devices require no backlight and provide a higher contrast ration that an LCD. Organic Cotton Coils (OCC): Coils made by Kangertech using unbleached organic cotton with no additives. Pass-Through: A battery with a micro USB connector which allows you to vape and recharge the battery at the same time. PCC: Acronym for Personal Charging Case. Pen: A style of e-cig similar in size to a ball point pen. Propylene glycol (PG): Used in e Liquid. PG creates the throat hit when you inhale the vapor. Pull: The act of inhaling the vapor from the electronic cigarette or vaporizer. RBA: Rebuildable Atomizer. Used by experienced Vapers who utilize wick and wire to create their own custom coils. They are used in conjunction with an eLiquid tank. RDA: Rebuildable Dripping Atomizer. Also used by experienced Vapers who utilize wick/cotton and wire to create their own custom coils. RDA do not use eLiquid tanks and the eLiquid is soaked directly on the wick or cotton. Smart battery: A battery with a digital display. Smart batteries normally display battery strength and puff count. Smoke Juice: Another term for e Liquid. SSOCC: Stainless Steel Organic Cotton Coil. Stainless Steel (SS): A popular wire used in pre-built coils. Known for its purity and clean flavor. SS coils come in a variety of grades with “surgical steel (SS316)” being the most popular. SS coils require no ramp up time. Starter Kit: A Starter Kit is a complete kit, which normally includes the vaping device (battery and tank/cartridge/cartomizer, atomizers if required, and charger(s). Some kits also include e Liquid. A Starter Kit basically means you can start vaping straight out of the box and no other supplies are required. Sweet Spot: The voltage and wattage settings which give you the most personal satisfaction in your vaping experience. Sub-ohm – Vaping using atomizers with a resistance of less than 1.0 ohm. Tank: Tanks are the alternative to cartomizers. They include unique atomizer assemblies, wicks and drip tip. The tank usually contains a 1.6ml or higher reservoir for your e Liquid. 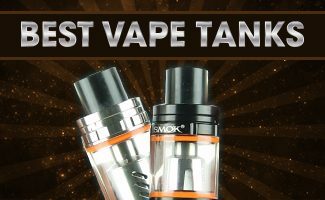 There are a variety of tanks available on the market and not all parts are interchangeable with other brands. TCR: See: Temperature Coefficient of Resistance. Temperature Coefficient of Resistance: The resistance and corresponding heat of a particular type of alloy used in a coil (more). Temperature Control (TC): Limiting the temperature the coil is allowed to heat up to. The coils are generally made of Nickel, Titanium or Stainless Steel. Temperature Control Mods: Temperature Control Mods control and limit the temperature of your atomizer coils. Throat Hit: The heat sensation one feels when inhaling vapor, Usually, a stronger throat hit is achieved if there is a higher concentration of PG found in e Liquid. Titanium Wire (Ti): Titanium wire can be used VW and TC mode. As the temperature in the coil increases so does the resistance. Ti wire is usually surgical grade, has a higher resistance that Ni 200 and considered generally safer to use. USB Charger: This provides the ability to charge your device through a computer, laptop or a wall socket via a USB cable. Vaping: The act of inhaling and exhaling the vapor generated with an electronic cigarette or vaporizer. The term is comparable to “smoking” which is used with cigarettes. Vapor: Similar to smoke, vapor is the end result when e Liquid makes contact with a heated coil. Vapor is predominately water vapor. Vegetable Glycerin (VG): Used in e Liquid. The more VG in your e Liquid the more vapor it produces. Vent Hole(s): Small openings around the battery compartment of your vaping device to allow battery gasses to escape. Wick: A wick delivers e Liquid to the coil drawn by capillary action.